This James Braid course is a very challenging 18 hole moorland layout and will provides all standards of golfers a very enjoyable experience. The course is located above the village of Skelmorlie in North Ayrshire and enjoys some stunning scenery, with sea and mountains to the north and west, and wild moorland to the east. There are seven par 3’s to be found on the course and playing these well is often the key to a good score. The rest of the holes provide a mix of playing challenges, including accuracy from the tee and sensible course management choices. When the greens are in their prime they are some of the best in the area to play on. Skelmorlie is well known for the standard of its greens and it is usual for the greens and the course to be in good playing condition year round, and even after heavy rain the course is nearly always playable fairly quickly, even when other courses are not. The eighteen holes fall naturally into three groups – The bottom or first five, the upper eight or top part of the course, and the final last five in the centre of the course and with each loop returning conveniently close to the clubhouse. Founded in 1891, the course today no longer bears any resemblance to its original layout. Indeed in the early days the course was only 9 holes and the golfers often had to play around the local flock of grazing sheep. With the addition of four new holes in 1909, including the infamous ‘Bullfield’ holes the club then became a 13 hole club – one of the few in the world. A regulation round of 18 holes was achieved with the members playing the first five holes twice, after commencing their round at what is the current 14th hole, a tough openning hole, especially in a strong south westerly wind and water on the right. In the early nineties, under the guidance of Head Greenkeeper, Sid Mercer, Greens Convenor Jimmy Cathcart and Committee member Nigel Wright, the groundwork for 5 new holes was laid. In August 1999, Club Captain, Nigel Wright proudly opened the new 18 hole layout and the oldest 13 hole club in the world was no more. The new holes have now fully matured and Skelmorlie is now an excellent example of a moorland course with testing par 4 holes and a number of very testing par 3 holes. 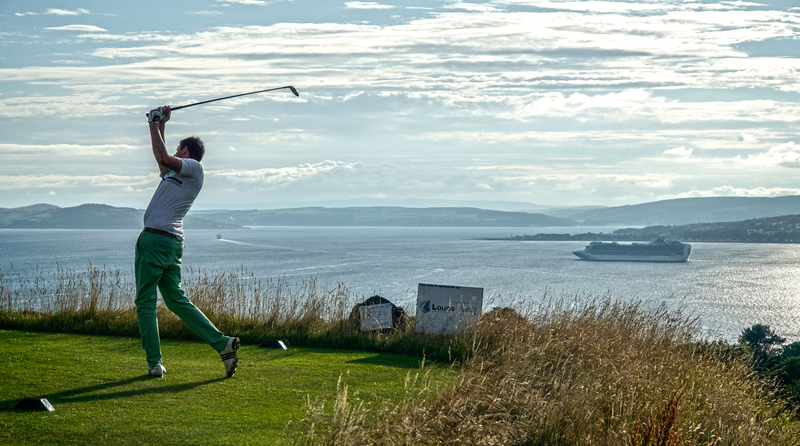 Any visitor today playing to their handicap around Skelmorlie, will be well pleased with their golf game. To view information on a hole please select a hole number.